There are some nights when I come home from work feeling so exhausted that I tell Eugene, "I'm tired. I don't think I'm going to cook tonight." He'll nod and simply say, "OK, do you want to order something? Should I just make a sandwich?" No," I reply as I get up and walk into the kitchen. "I'll figure something out." A little while later, I'll walk back out holding a couple plates that look like the one above. Eugene will roll his eyes and say, "Man...I'm SO glad you didn't cook tonight." I realize that this sounds kind of ridiculous, but the point is just to show that there are dishes--even ones as pretty-looking as this one--that are pretty pain-free to make. Even (or especially!) on those days when you feel like you just don't have it in you. The trick is just making sure you have the right ingredients on hand. 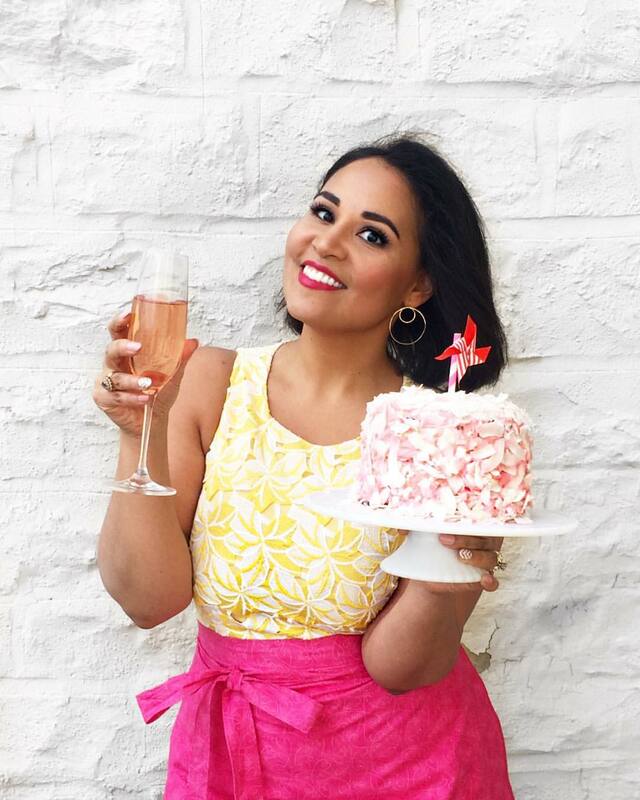 Last week, I did an interview for a magazine during which I confessed to the reporter that one of my secrets for getting weekday meals on the table quickly is frozen seafood. Not, mind you, those oddly rectangular pieces of pre-flavored fish "filets", but rather the large bags of frozen raw shrimp or bay scallops that you can usually find at warehouse stores like BJs or Costco. I like to keep a bag or two of these in the freezer so that on those evenings when I get home late from work, I can still quickly throw together a satisfying meal with very little effort. I like to think of them as my kind of convenient foods. Not processed and loaded with scary unfamiliar ingredients, but rather foods that even in their natural state are simply and naturally convenient. The beauty of frozen shrimp or bay scallops is that you can always keep them on hand, but you don't ever have to plan ahead. While most other meats and fish freeze are wonderful to have in the freezer, they still require a bit of advanced planning. I, for example, ALWAYS forget to pull the steaks or pork chops out of the freezer the morning (or night) before I want to cook them. Often this will happen to me 2-3 days in a row before I manage to get my act together. I think it must be hereditary; while we were growing up, my mother regularly would call home from the office asking someone to "please take the chicken out of the freezer," so that it would be defrosted by the time she got home from work. 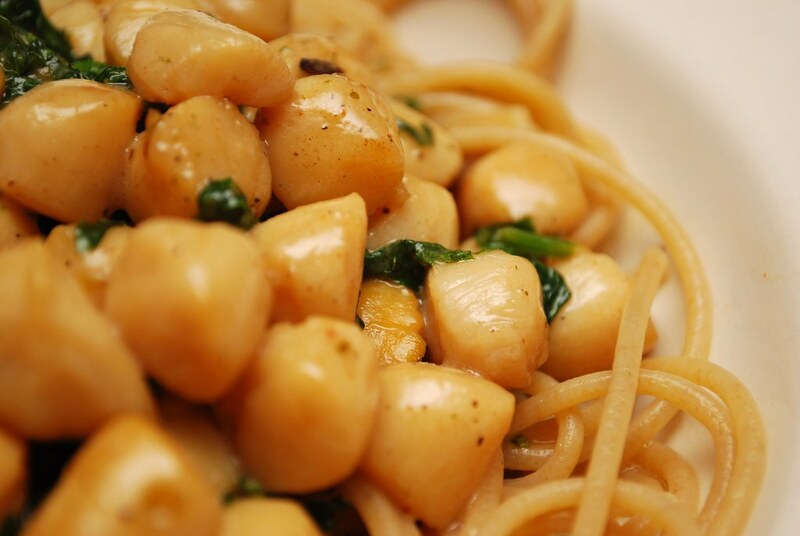 Hence these wonderful little bay scallops! Which don't need to be thawed, and which cook so quickly that they can literally just be stirred into a simmering sauce or hot pan while still frozen. I came up with this particular recipe on a night when both groceries and patience were in dangerously low supply. A stick of butter, simmered on the stove until nutty and brown became the basis for the sauce. 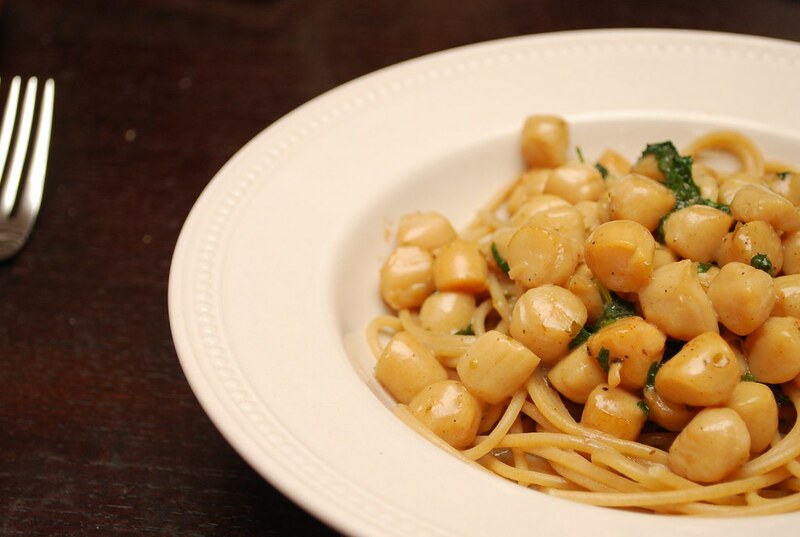 A few herbs, a splash of cream, and a few generous handfuls of the sweet little bay scallops where all I needed to round out the dish, which I served on a bed of whole wheat spaghetti (because I firmly believe the whole wheat cancels out all that naughty butter and cream). You know I love when you play around with my recipes and make them your own, so if you're not a scallop fan, remember that you can easily substitute shrimp, or even small pieces of chicken (adjust the cooking time to make sure the latter is fully cooked if you go that route). The sauce is also lovely on seared bay scallops. Heck! It's actually even good without any kind of meat or fish over the pasta. Place stick of butter in small saucepan over medium heat. Let butter cook until golden brown with a nutty aroma. Typically at this point I would ask you to strain the butter so that the solids are removed, leaving you with a nice clear browned butter. I find, however, that for a quick meal like this, it's perfectly OK to just pour off the top 3/4 of the butter into the skillet you'll be cooking the sauce in; the solids will have sunk to the bottom anyway and won't get in the final dish. Season the boiling water and add the whole wheat pasta. Cook for 7-8 minutes or until al dente as directed. 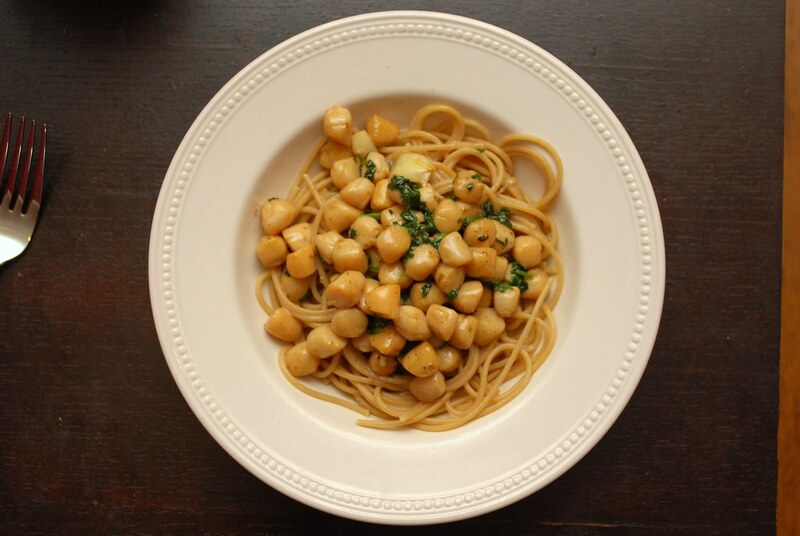 While the pasta cooks, in a separate large skillet over medium heat, pour in the top 3/4 of the brown butter as described above, and add the garlic cloves. Let cook for two minutes before adding the 3/4 cup of cream and the 1/4 cup of sherry. Stir together and bring up to a simmer. Add the bay scallops and stir until well coated in the sauce. Stir in the chopped parsley and season with salt and black pepper. Let cook for 2-3 more minutes or until the bay scallops are all cooked (they will look opaque and crackle a bit at the sides). 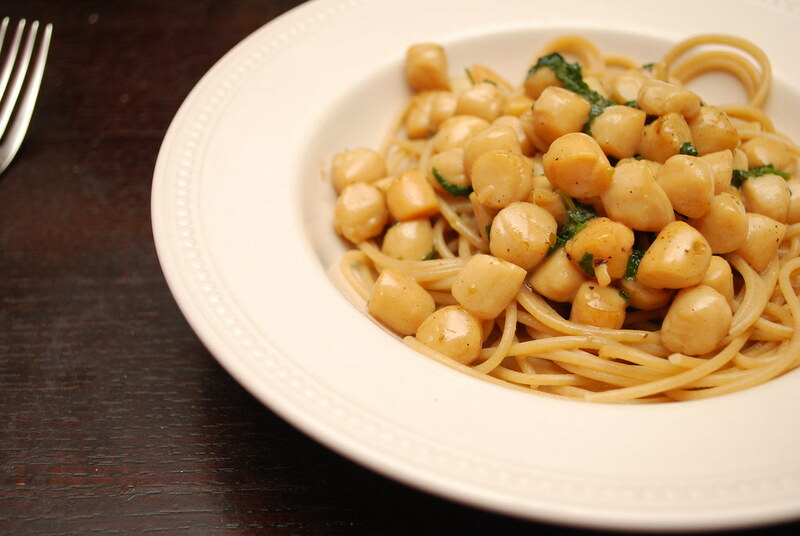 Serve the scallops and accompanying sauce immediately over the cooked and drained pasta. Thanks for this tip Alejandra! I had no idea frozen scallops cooked so quickly, I'm going to keep a bag in the freezer from now on! I do the same, but with chicken and ground turkey. I have a lot of it on hand in the freezer, and my go to when I don't want to cook is grilled chicken with wild rice and frozen peas. I've been having a small love affair with Bay scallops myself recently. I love the idea of covering them in brown butter. Yum Yum! I second your philosophy - I also always keep bags of frozen shrimp and scallops and frozen fresh unprocessed raw fish fillets. They cook quickly - served over pasta like you've done here, or with a frozen baguette and fresh, microwave steamed vegetables, it's on the table in 10-20 minutes. Thin pork chops and thinly pounded and then frozen breast of chicken work just as well. I am totally with you on frozen seafood. I always have frozen shrimp in the house, and some frozen tuna steaks have come to the rescue on occasion too. Another bonus on frozen shellfish (in addition to how fast it defrosts) is it is usually fresher than the "fresh" from the seafood counter or fishmonger. Most shellfish is frozen directly on the boat, so when you buy it "fresh," it really just means they have defrosted it for you. I always have shrimp on hand for speed and ease - now I am going to add bay scallops. I haven't tried frozen because I thought with the water content, they were harder to caramelize - but maybe that is just for the larger sea scallops? Thanks for this idea ... and your link ... now I'm off to see what else I missed on your blog! Great point about how frozen seafood is also "fresh." And you're right that the frozen scallops are harder to caramelize, although I have been able to by using a heavy and hot pan and just a few scallops. Or I just use them in dishes where caramelization isn't as important; in sauces like the one above or in a spicy tomato broth (I usually mix with clams); also in soups and chowders.